The Ballad of Johnny Longstaff is the story of one man's adventure from begging on the streets in the north of England to fighting against fascism in the Spanish Civil War, taking in the Hunger Marches and the Battle of Cable Street. It's a timely, touching and often hilarious musical adventure following the footsteps of one working class hero who witnessed some of the momentous events of the 1930s. With the The Young'uns trademark harmony, honesty and humour the Teesside trio bring together sixteen specially composed songs, spoken word, striking imagery and the real recorded voice of Johnny himself to tell a remarkable human story oozing with modern relevance. Q/: Who are The Young'uns? Sean Cooney (SC): We are Michael Hughes, David Eagle and myself, Sean Cooney - three folk singers from Teesside in the North East of England. 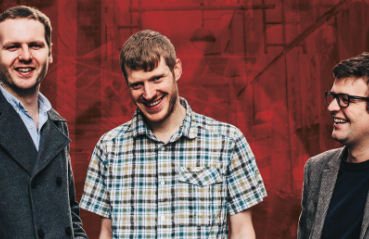 With their trademark harmony, honesty and humour the Teesside trio bring together sixteen specially composed songs, spoken word, striking imagery and the real recorded voice of Johnny himself to tell a remarkable human story oozing with modern relevance. SC: Michael and I have known each other virtually all our lives since we first met in primary school. We then met David when we were 17. Q: How did The Young'uns come about? SC: We were all into different types of music and then one night whilst out drinking in Stockton-On-Tees we somehow stumbled across our local folk club in The Sun Inn. We had no idea that in the back rooms of pubs all over the country ordinary people met to share songs, often about where they come from, often without instruments. It was a revelation. We had no idea such songs existed. There were songs about where we came from, songs about places we knew, songs that could be sung in a North East accent. We couldn't believe it. We thought, "Why hasn"t anyone ever told us about these songs? Why didn't we learn them in school?" We kept going back to the club every Monday night and, because we were considerably younger than everyone else, we were given this really embarrassing name and now (almost 15 years later) we still haven't managed to get rid of it! We never had any intention of starting a career in folk music at that stage. We just loved going to the club and joining in the choruses and soaking up the local songs. Q: What are The Young'uns known for? SC: We're known for our tight harmonies but also having a laugh and bantering with each other on-stage. In more recent years we've gained a reputation for writing and performing songs with a social conscience. Our song Be the Man tells the tragic story of Naz Mahmood - who took his own life following his religious family"s reluctance to accept his sexuality - and his fiancée Matt's mission to campaign for change. Q: What are your most memorable achievements? SC: We've been fortunate to win three BBC Radio 2 Folk Awards (Best Album 2018 for Strangers, Best Group in both 2015 and 2016), have played Glastonbury twice, and performed at hundreds of festivals, concert halls and venues in the UK, Europe, Canada and Australia. We constantly tell each other just how lucky and privileged we are to sing for a living. For me though it's hearing people's personal connections to the songs that is the most special. A number of people have told us just how important Be the Man has been in their lives. In one instance, a man who struggled to accept his son's sexuality told us that the song has brought them closer together. Q: Who was Johnny Longstaff? SC: Johnny Longstaff was an ordinary man who saw and did extraordinary things. He was born in our home town of Stockton-On-Tees in 1919. At the height of the Great Depression he begged for bread on the streets. Within a year he had lied about his age and went to fight against fascism in the Spanish Civil War. Wounded three times he arrived back in Britain months before the outbreak of WW2. SC: One night after a gig in Clevedon in Somerset in May 2015, Johnny's son Duncan approached us with the story of his Dad's life. He encouraged us to listen to the recordings Johnny made for the Imperial War Museum in 1986. Duncan had hoped they would write a song about his Dad - we actually ended up writing 16 songs! The songs were inspired by Johnny's oral testimony but also the access we were kindly given to his unpublished memoirs, his extensive photo archive, and library of Spanish Civil War literature (complete with his own hand written 'corrections'), and many anecdotal memories from the Longstaff family. Q: What should I expect if I go to see the show? SC: The show is unlike anything we've ever done before. It's a piece of folk theatre I suppose. Set against a backdrop of striking imagery, it's a musical adventure through the tumultuous 1930s. Our sixteen original songs weave in and out of Johnny's own voice to tell his story. Johnny's recorded voice is so warm and the journey he takes us on is emotional; at times it's harrowing, at times it"s hilarious. He was one ordinary man who saw and did many extraordinary things. Q: Why is the show relevant to my area? SC: On each night of the tour the show we will make reference and pay tribute to local men and women who feature in Johnny's story. Whether they be some of the thousands of British families who took in the Basque refugee children who fled Spain in 1936 or the idealistic men and women who took up arms against fascism alongside Johnny in the 1930s there will be a local element to every show. Q: Has a recording been made of the show? SC: The album 'The Ballad of Johnny Longstaff' was released in December 2018. It includes all songs from the show along with selected pieces of Johnny's oral testimony and is accompanied by an extensive dossier of historical notes and lyrics along with poster, facsimile picture and extras.